The classic 'Check image' node is only minimally tolerant towards deviations. Using the default algorithm of comparing pixel by pixel it is not possible to check images that are generated in a not-quite-deterministic way or differ in size. 3.5.1+ Since QF-Test 3.5.1 the definition does not need so start with algorithm=<algorithm> but can simply begin with <algorithm>. It is also no longer necessary to define the parameter 'expected'. QF-Test uses a default value if it is not set. Please see below for more information. In the related run-log (see section 8.1) of a failed check you have the opportunity to analyze the results of the algorithm as well as the result of probability calculation. If you activate the option Log successful advanced image checks all tolerant image checks will be logged for further analysis. The classic - or default - image check compares the color value of every single expected and actual pixel. If at least one expected pixel differs from the actual pixel the check fails. The option Tolerance for checking images defines the tolerance for comparing pixel values. This pixel based check is suitable if you expect an exact image match with minimal tolerances or any deviations. Whenever your application renders the component not fully deterministically, this algorithm is not suitable. The classic image check doesn't transform the image, thus the result looks identical to the original image. The classic image check is used when the 'Algorithm for image comparison' attribute is empty. This algorithm is similar to the classic algorithm, but accepts an amount of unexpected pixels. It splits every pixel in it's three sub-pixels red, green and blue. Afterwards it checks every actual color value against the expected color value. The final result is the amount of identical pixels divided by the total amount of pixels. The calculated result is checked against an expected value. If your images are not rendered fully deterministic but you accept a certain percentage of unexpected pixels, this algorithm may be useful. But it is not suitable, if the actual images are used to have shifts or distortions. looks identical to the original image because this algorithm does not manipulate the image. The 'Pixel based identity check' should be used. Defines which probability you expect. Valid values are between 0.0 and 1.0. If not defined, use 0.98. Defines, if the actual image should be resized before calculation to match the size of the expected image. Valid values are "true" and "false". A detailed description of this parameter can be found in subsection 52.3.1. This algorithm splits every pixel in it's three sub-pixels red, green and blue. Afterwards it checks every actual color value against the expected color value to calculate a percental similarity. All percental deviations are added up and used for calculation. The final result is the average deviation over all color values and all pixels. The calculated result is checked against an expected value. If your images are not rendered fully deterministic but you accept a certain deviation, this algorithm is a possible candidate for your purpose. If you accept deviations for some pixels, but the average deviation all over the image is small, this algorithm is also suitable. The 'Pixel based similarity check' should be used. This algorithm partitions the image into quadratic blocks with a selectable size. The color value of each of these blocks is calculated as the average of the color values of the pixels the block contains. If the width or height of the image is not a multiple of the block size, the blocks at the right and bottom edge are cropped and weighted accordingly. The actual blocks are checked against the expected blocks. The final result is the amount of identical blocks divided by the total amount of blocks. This algorithm's purpose is to check an image which only differs at some parts but is identical at the remaining parts. The algorithm 'Block-based identity check' should be used. Defines the size of each block. Valid values are between 1 and the image size. Defines the minimal match probability for the check to succeed. This algorithm also partitions the image in quadratic blocks with a selectable size. The color value of each of these blocks is calculated as the average of the color values of the pixels the block contains. If the width or height of the image is not a multiple of the block size, the blocks at the right and bottom edge are cropped and weighted accordingly. The color value of each expected block is checked against the actual block. Their color values are analyzed for percental similarity. The final result is the average similarity of all blocks with their weight taken into account. This algorithm is suitable for checking images with similar color variances. The algorithm 'Block-based similarity check' should be used. 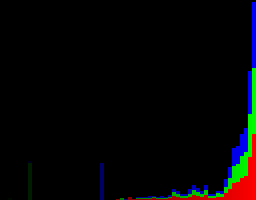 To create a histogram, an image is first broken into its three base colors red, green and blue. Then the color values for each pixel are analyzed to partition them into a definable amount of categories (known as buckets when talking about histograms). The actual fill level of each bucket is compared to the expected level. The result of the algorithm is a comparison of the relative frequencies of color categories. Histograms are used for many scenarios. For example it is possible to check for color tendencies or do brightness analyses. However, histograms are not suitable for checking rather plain-colored images. A 'Histogram' should be used for this image check. Defines how many buckets to use. Valid values are a power of 2 between 2 and 256. The Discrete Cosine Transformation is a real-valued, discrete, linear, orthogonal transformation which transforms the discrete signal from local range to frequency range. After transforming an image, you can eliminate low-order (fast oscillating) frequencies. The remaining high-order (slow oscillating) frequencies with the steady component (zeroth frequency = 0*cos(x) + y) can now be analyzed. You can define how many frequencies per basic color should be used for this image check. You can also specify a tolerance to accept cosine-oscillations as identical which actually differ. Low-order frequencies get weighted less than high-order frequencies when calculating the result. The Discrete Cosine Transformation is suitable for many kinds of image checks, which require certain tolerances. The more frequencies are used for analysis the sharper the image check is. 'Analysis with Discrete Cosine Transformation' should be used for this image check. Defines how many frequencies to analyze. Valid values are between 0 (steady component only) and the area of the image. The less frequencies are analyzed the more tolerant the check is. The tolerance is also dependent on the size of the image. Defines the (non-linear) tolerance for accepting different cosine-oscillations as identical. Valid values are between 0.0 and 1.0. The value 1.0 means every image matches every other image, because the maximum difference of each frequency is tolerated. A value of 0.0 means frequencies only match if they are exactly the same. A value of 0.1 is a good starting point because only quite similar frequencies are accepted as identical. When using this algorithm the image is first partitioned into quadratic blocks with a selectable size (see subsection 52.2.4). Afterwards every partition is analyzed using a Discrete Cosine Transformation (see subsection 52.2.7). The final result is the average of all results of these Discrete Cosine Transformations with consideration of the blocks and their weight. The Discrete Cosine Transformation used on the whole image deviates strongly in case of significant brightness differences occurring in the middle of the image because then the steady component (zeroth frequency), which is the highest weighted part, varies strongly. The partitioning circumvents this behavior because now only the affected partitions result in intense deviations while the other partitions stay untouched. 'Blocks for analysis with Discrete Cosine Transformation' should be used for this image check. Valid values are between 0 (steady component only) and the area of a block. This algorithm shrinks the image to a chooseable percental size. Afterwards the image gets resized to its original size by use of a bilinear filter. This filter effects a blurring, because every color value is calculated by use of neighbor pixels. The final result is the average deviation over all color values and all pixels of this transformed images. Depending on the chosen sharpness the images loose any desired image information. Thus this algorithm is valuable for nearly any scenario. A 'Bilinear Filter' should be used for this image check. Defines the sharpness of this bilinear filter. Valid values are between 0.0 (complete loss of information) and 1.0 (no loss of information). The sharpness is a linear parameter. This means a value of 0.5 eliminates exactly half (plus minus rounding to entire pixels) of information. The image-in-image search allows to find an expected image within a (larger) image. The check is successful when the expected image can be found anywhere using the defined algorithm. Furthermore, you can determine the position of the match. The image-in-image search allows to compare images if you don't know the exact position and thus cannot define an offset. The search can be combined with any algorithm and is thus valuable for any purpose. uses pixel-based similarity check (see subsection 52.2.3) to find an image of Q as part of the full image. The got image with highlighted region can be found within the run-log. Besides, the variables resultX and resultY are set to the location of the found image. Defines that the best match should be used. Defines that the first match which exceeds the expected match probability should be used. The image-in-image search uses multiple threads and thus finding anywhere is non-deterministic. resultX is the name of a QF-Test variable which holds the x-position of the found image. If a variable for the x-position is defined, a variable for the y-position has to be defined as well (see syntax above). resultY is the name of a QF-Test variable which holds the y-position of the found image. If a variable for the y-position is defined, a variable for the x-position has to be defined as well (see syntax above).